A bus company has offered passengers the chance to buy tickets over their mobile phone. Arriva Bus says it is the first time in the UK that people can order their tickets on the phone, then use their mobile as an electronic bus pass. Passengers can buy daily, weekly and monthly tickets, and simply show the mobile phone ticket when they board. Launching the service in Llandudno, Conwy, the company said the system would cover 1,000 routes across the UK. Michael Morton, managing director of Arriva Buses Wales, said: "The mobile phone is an essential part of modern life and m-tickets will give additional flexibility and convenience to our customers. "The launch of m-ticketing across all our regions will mean that millions of bus journeys will be taken using the technology. "We believe this represents the largest introduction of its type in the world." The system works on most current models of phones, and just needs passengers to register on a website, and then add cash to their account, either through a credit card, or in cash through the nationwide PayPoint system at shops, post offices and garages. 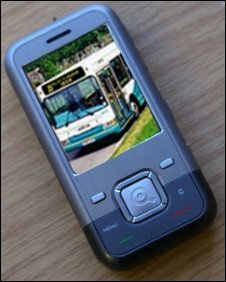 Once a ticket is downloaded to their phone, it is activated on the day of travel and simply shown to the bus driver. "Customers can buy tickets using their phone at anytime from wherever they happen to be. It saves them searching out the cash to buy a ticket and speeds up getting on the bus as they simply show the ticket on the phone display to the driver," added Mr Morton. The company said that by using the mobile phone network to introduce the electronic ticketing, it has meant no downtime fitting equipment to its buses. Passengers using the system can also benefit, with a 10% discount on monthly travel tickets.